THE SUSTAINABILITY REPORT | Let’s create a healthy, balanced relationship with the Earth – AND grow the economy while doing it. Let’s create a healthy, balanced relationship with the Earth – AND grow the economy while doing it. When did the Environment become a Partisan Issue? Recently I read an obituary of a “Tax Court Judge turned Environmental Activist” in the Washington Post which offered a striking commentary on the current state of affairs on environmental policy. This tax court judge turned environmentalist was Russell Train, Republican. As the director of the Environmental Protection Agency from 1970 through 1977, he led the agency through some of its toughest early years (the EPA was launched in 1970 – its first director left after a short stint). As noted in the article above, “Mr. Train embodied an earlier era in which conservatives embraced the label ‘environmentalist'”. So the question I posit is, When did the Environment become a partisan issue? We all want clean air, clean water, safe products, and a world that is sustainable (whether WE know it or not – ecosystem collapse would be devastating, even for the richest among us). The real questions are, have the environmentalists on the left pushed for standards that are unreasonable and unjustified on economic or other grounds? Or have those on the right ignored an earlier era of bi-partisan environmentalism and abandoned environmental values for profit or other values? Possibly encouraged by incentives created by campaign contributions from the companies that are the largest polluters and cause the most environmental damage? 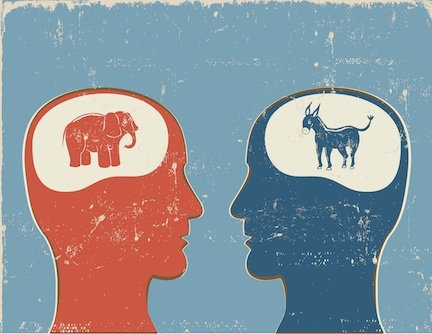 As a good friend of mine likes to say, “we need to get down to causes and conditions”, and I would like to get to the causes and conditions of the current partisan divide on environmental policy. I have some thoughts on answers to these questions, but will save them for future posts. For now, I ask you, When did the Environment become a partisan issue? and should it be??? Is Population Control a valid form of Environmentalism? Population control is a solution to current environmental issues (climate change, ecosystem destruction, loss of biodiversity, etc) that very few want to talk about, as some feel that reproduction is an unalienable right and/or limiting it treads on religious and/or other moral values. But is reproduction really an unalienable right? and at what point do the rights of us all to live on a healthy planet supersede individual religious beliefs/moral values? These are tough questions and therefore one reason why the subject is avoided, but it really is the “elephant in the room” for most environmental discussions. In a planet of 1 billion people, we likely wouldn’t be having climate change talks or many of the current environmental issues. One definition of freedom is that I am free to do whatever I want to do, as long as it doesn’t impose (unfairly or unnecessarily) on the freedoms of others. What people and governments have been arguing about since the beginning of time is the when one’s right to freedom imposes on another – there are grey lines, and courts and city halls decide these matters on a daily basis. Imagine for a moment we are on an island with 9 people, with a fresh water generator that can safely provide for 9 people. What’s the right answer to population control? NO MORE PEOPLE ON THE ISLAND (or create better technology)!! Technology is one answer, but the Earth has limits that we may (likely) be approaching and/or have surpassed. In the case of Population Control – the impact of an additional person on our fragile planet has an undeniable impact on everyone of the existing residents. I am not proposing the Draconian one child policy of China (which by many projections limited the population by 400 million this generation). But something should be done. Some propose to use economic growth to solve the problem – many advanced economies have the opposite problem of high birth rate countries – their birth rate is too low (below replacement value). Many advanced economy countries are only growing due to immigration. Therefore, the theory goes, if citizens of the world gain wealth, they will procreate as a slower pace, and the problem solves itself. There is data to support this, but it doesn’t seem like a viable short term solution, and how much of the world’s resources will be used to create that wealth? Unfortunately many of the individuals creating population growth are the ones least able to support their children – acting on perverse incentives such as high infant/child mortality and cultural norms that abhor contraceptive use. What is an ethical person to do? We could take a play from international politics and try to negotiate a better outcome, but a negotiated solution seems unlikely without other incentives. Other solutions include permits or taxes for children, contraception education and distribution, and draconian measures such as mandatory sterilization. All with their own ethical and moral baggage. From some perspectives limiting population is not cruel, it is just is a solution. And, unfortunately, if we don’t prevent births somehow without a giant leap in technology, then we all will suffer and the poorest will suffer the most. We may level out to a certain population over time (some project 10 billion), but at what cost, and how much suffering? I must ask again, is population control a valid form of environmentalism? Let’s keep the conversation going. Isn’t a Carbon Tax really an Energy Independence Investment? Let’s assess a Energy Independence Investment (EII) Fee and LOWER income taxes. A win for conservatives and liberals – lower taxes, green growth, stimulate renewables, love it… We need to change the language to get this done. On the flight back from Montreal (which is a great city BTW) I read a somewhat scary essay in the July/August edition of Foreign Affairs Magazine titled, “Environmental Alarmism, Then and Now” by Bjorn Lomborg. The author sought to discredit the Club of Rome report completed 40 years ago that predicted potential environmental collapse due to human activity, but did not bother to cite ANY current Literature on Sustainability. He described paper recycling as unnecessary because some countries have sustainable forests and that organic farming is “killing tens of thousands of people”. Because a scientist made an incorrect prediction 40 years ago does not release us from our current situation: we need to change the way the economy functions – its is unsustainably using finite resources. There may be some factual truth to his arguments on some issues, but regardless of some errors in the report or some environmental successes, sustainability needs to be a priority as we look forward. Yes we can extract more resources from the earth, but at what cost? What are the long run implications of loss of habitat, ecosystem destruction, climate change, aquifer poisoning, fishery destruction, loss of rain forests,…? I do agree with the author in some of his criticism, I think it can be counterproductive to ONLY have a doomsday scenario scripted. I believe in people and their ingenuity – if properly harnessed I believe WE can create a sustainable economy in which we all can prosper (and have clean air to breath, clean water to drink, and clean food to eat). I believe is starts with good policy, politics, and economics. 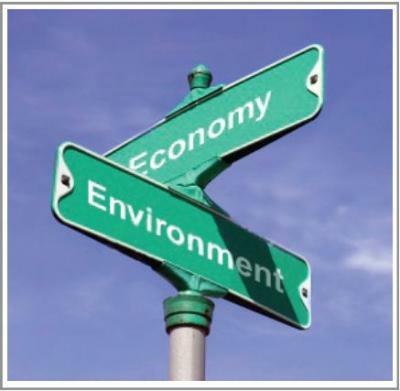 Action Oriented Market Based Environmental Policy – Love it! They are doing great work to find market based solutions to the environmental challenges we all face. We discussed the challenges and opportunities in renewable energy in the Midwest. I found inspiration in our conversation today – please support organizations/politicians that support this work – it is imperative to creating a sustainable economy. My plan for this blog is to offer salient and interesting commentary on public policy within the following areas: sustainable development, environmental economics, green growth, macroeconomic,energy policy, environmental policy, energy efficiency, renewable energy and trade policy. I am particularly interested at the intersection of macroeconomic policy and environmental/energy policy (impact of trade agreements and monetary policy on the environment). Essentially I would like to offer advise on saving the world from ourselves. Most of the “problems” in the above areas are a direct result of people acting in their own best interest, but the result is a collectively unsustainable economy overly focused on excessive growth at all costs (environmental, social, other). I am by no means negative or pessimistic on these issues, but we do have challenges in these areas that need to be addressed as soon as possible. As a society we have been amazingly successful in the technological sphere (this blog is a testament), but we now need to apply the same amount of effort in the public policy realm. I am pro-business and pro-prosperity, but we need to find a way to live in harmony with our world. I firmly believe good economics and good policy are means to that end. As they say, “Follow the Money!!”. If you are reading, welcome aboard.